This post was brought to you in partnership with Woodbridge Wine, as usual, all opinions are my own. Halloween is over and Thanksgiving will be here before you know it. Time to start planning your Thanksgiving recipes, stuffing and hot cocoa are good places to start. These yummy recipes are created by Alex Guarnaschelli and Woodbridge Wine by Robert Mondavi. 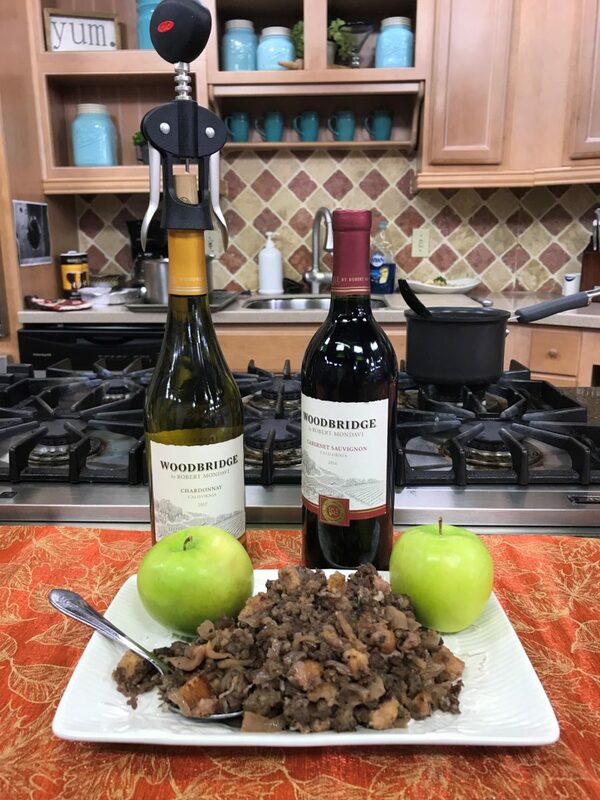 Why not jazz up Thanksgiving with this yummy Woodbridge Red Blend Onion, Sausage and Apple stuffing. This recipe is so easy to make, that I made it in my hotel room while I was on the road for a show segment. 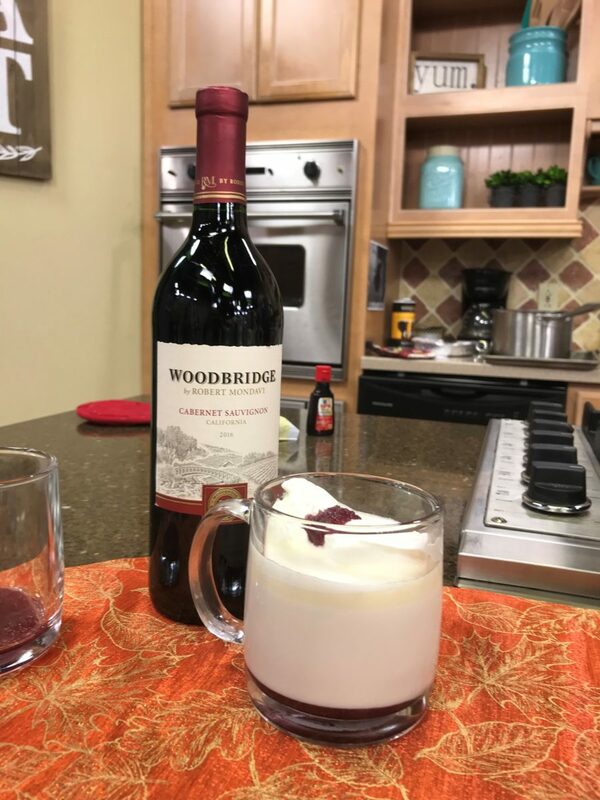 Reduce the red wine:In a medium pot, reduce the Woodbridge by Robert Mondavi Red Blend over medium heat until there is ¾ cup total liquid, 15-20 minutes. Cool. Cook the onions and apples: In a large skillet, melt 2 tablespoons (1/4 stick) of the butter. Add the onions, season with salt and pepper and cook over medium heat until translucent, 3-5 minutes. Add the apples and cook for 3-5 additional minutes until they meld with the onions, stir in the reduced wine and brown sugar and simmer an additional 2-3 minutes. Remove the skillet from the heat and transfer to a bowl to cool. Toast and butter the bread: Arrange the bread slices in a single layer on a baking sheet and toast in the oven until light brown. While the bread is still hot, use remaining butter to butter both sides of each piece. Cut into 1-inch squares and transfer to a large bowl. Toss with salt, pepper, thyme and half of the sage. Set aside. Finish the stuffing:Combine the onion mixture, the cooked breakfast sausage, remaining sage, mozzarella and the toasted bread. Mix to blend and add the cup of chicken stock to moisten. Stuff the turkey:Place the turkey on a flat surface, season with salt and pepper on the inside and out, and stuff the cavity with the stuffing. Truss turkey or, alternatively, tie the legs closed with a strong piece of kitchen twine to assure the stuffing doesn’t fall out as the turkey roasts. Wrap any remaining stuffing in tinfoil and keep the tinfoil fairly flat, like a large envelope. Cook the turkey:Transfer the turkey to a roasting pan, fitted with a roasting rack if desired, and soak the cheesecloth in the melted butter. Brush any remaining butter on top of the bird and cover the breasts with the cheesecloth to prevent the top skin from burning before it is cooked. Lower the oven to 350 F and place the roasting pan in the center of the oven. Cook for about 12 minutes per pound. Finish the turkey:After about 2 hours cooking, remove the roasting pan and place the tinfoil package containing the stuffing in the bottom of the pan. Remove the cheesecloth from the top of the breasts and return the turkey to the oven to brown the top and finish cooking. How do you know when it’s done? The temperature of the thigh (where the meat is thickest and takes the longest time to cook) meat should register 160 F when tested with a thermometer. When done, remove the bird from the oven, transfer it to a flat surface (or serving platter) and allow it to rest for 20-30 minutes before removing the stuffing and carving the meat. Transfer the stuffing to serving platter. 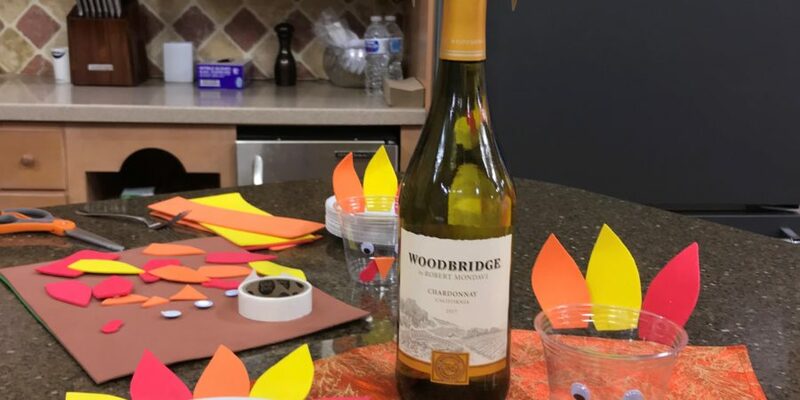 Reduce the red wine: In a medium pot, reduce the Woodbridge Cabernet Sauvignon over medium heat until there is ¾ cup total liquid, 15-20 minutes. Keep warm. Make the Cabernet caramel:In a medium saucepan, combine the sugar and water and cook over medium heat for 6-8 minutes or until an amber-colored caramel forms. Remove the pan from the heat and carefully stir in the reduced wine. Return to the stove and simmer 3-5 additional minutes to allow the flavors to meld together. Keep warm. Serve the drink: Spoon some Cabernet caramel into the bottom of four large mugs or 6 smaller cups. Pour in the hot white chocolate mix. Top with whipped cream and drizzle with additional Cabernet caramel. Have kids at the party? Simply omit the rum and the caramel and dust with a little cinnamon instead! Previous Post DIY Halloween Party Costumes, Cocktails, Treats Oh My!